One of the primary components in a car that has a direct impact on fuel efficiency is the air conditioner. Apart from making life uncomfortable while on a drive, a mal functioning or below par system puts additional pressure on the engine for maintaining a set temperature. This again results in lower fuel efficiency and increased running cost for your vehicle. To get out of this vicious circle, it is always advisable to have it periodically serviced and checked. However, only a reputed and approved service station should be entrusted with the task of air conditioning regas in Footscray so that the system always works at peak performance levels. As any trained and skilled car air conditioning mechanic in Footscray will tell you, regas should be carried out once every two years. This exclusive servicing should not be associated with other general checkup or repairs. 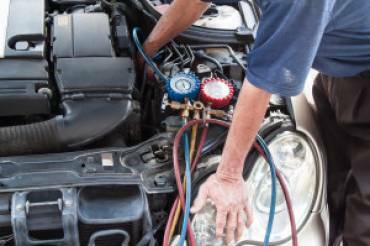 Nevertheless, the focus of any car owner should be to have this task carried out at authorized garages that has the latest tools and equipment as well as experienced technicians to carry out air conditioning regas in Footscray. The whole process is complex and intricate in nature. The existing oil, dye and refrigerant are drained out and the components dried out. New gas and liquids are topped up and the gas pressure is checked after a while. A drop at this point indicates a leak which has to be fixed. Finally, the car air conditioning mechanic in Footscray will inspect whether the interior of the vehicle is reaching the desired cooling levels. Western Auto Services is authorized and reputed service centre for air conditioning regas in Footscray. Even though we are based in Tottenham, Victoria, we serve the residents of Footscray too. Our team of trained mechanics has the necessary professional expertise to carry out regas with precision using the latest and most sophisticated tools and equipment. We are also authorized to undertake repairs and servicing of LPG kit fitted cars and give the mandatory 10 year valid LPG tank testing certificates. Give us a call or better still fill up our online form with details of issues with your vehicle and we’ll send a free no obligation quote.